Per Kirkeby is an artist, a poet, a maker of cosmogonic maps. Walking into the exhibit of 1980’s paintings and bronzes at the Michael Werner Gallery is being transported into a world of lost relics. Unchartered lands set up shop in your psyche. Underlying structures organize an undecipherable language that speaks loudly and persistently. Layered marks crash, collide and build. A symphony climaxes as it disintegrates. 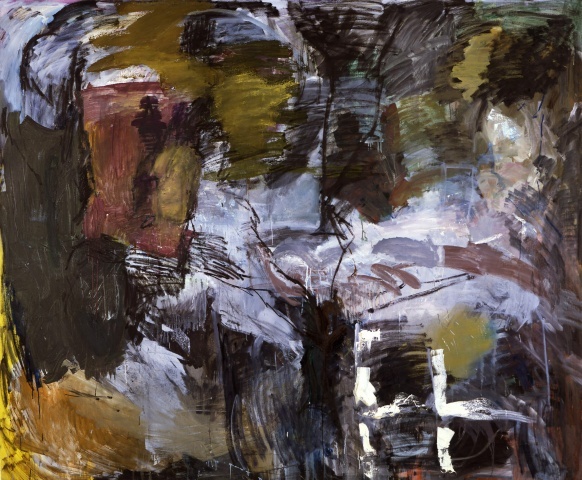 "Herbstbaum III (Autumn Tree III),” 1985, is the first painting to insist on attention. Two steles hold court in the foreground of a mystical forest by the side of the river. A few marks suggest this spacious surrounding outside the picture frame. The yellow totem stands erect while disintegrating, it’s unflappable partner solid in thick spackled strokes of brilliant light blue. The title suggests a portrait of a tree, the painting a signpost to another world. In “Untitled,” 1981, a landscape becomes a world becomes a language of mystery. Charcoal marks render the construction, layer upon layer, then falter, losing their momentum. Deep bluish greens turn into dark umbers, thick slabs of white take the limelight and then bow to the surrounding darkness. Nearby layers of scrawls like underbrush, rise and fall, thick and thin, awaiting their moment in the dim, diffused light. The secrets of the universe are revealed and then gone. Memory has disintegrated in erased marks. The bronzes are slabs that once marked sacred territories, forlorn yet stoic on their isolated pedestals. The heaviness of their material seems like knights in armor. Only when their forms are transported into the paintings in rich purples and greens and black blues do they become fluid. Animated and butting against each other, they are more expressive in brushstrokes and plays of light.